I have been holding out on you. Yes, yes I have. But I’m here to share with you now, that anything is possible with vegetables! I just want to inspire you to know that you can do anything you set your mind to. I’m proud to announce that I competed in my first ever bodybuilding/bikini competition at 41 years old, and took home first place in the masters class. This win earned me an IFPA Pro card on top of it! A very proud moment in my life. The competition was held on November 22, 2014. This is not just a win for me, it’s a win for vegan athletes everywhere who are spreading this amazing message of health and kindness. It’s a win for the animals who desperately need us to be their voice and it’s a win to help break the old stereotypes of having to do things a certain way. You CAN be kind and strong at the same time! You CAN build muscle on a vegan diet! Why did I compete? When I turned 40, I decided to kick life up a notch and knock something off of the bucket list. Competing has always intrigued me. I used to lift weights in my teens and early twenties but the bikini division has only existed since 2010. I feel that the universe planned it perfectly. I got to compete 100% as a vegan (which I was not in my twenties). I could still keep a feminine look, which I prefer. Being 41, I didn’t have to compete against the 20 somethings! But I did that anyway! Just for fun. Mostly, I took this challenge on because I have been so crazy inspired by vegan athletes over the past few years (check out vegan bodybuilding and fitness) that I too wanted to experience the satisfaction of proving you can indeed build muscle on a plant based diet… turns out, I feel better in my forties than I ever did in my twenties eating this way (in general and at the gym), and I like my results so much better on a plant-based diet. I absolutely love that I can compare the two lifestyles, because I have real life experience training both ways. Although I never made it to the stage in my twenties, I ate enough “bodybuilding food” aka chicken, to last a few lifetimes. I don’t even want to think about that… I’m living life outside of that box now. Bodybuilding on a vegan diet is achievable, maintainable and super healthy. Healthy for the mind and soul as well as the body. Not to mention you spare sentient farm animals an awful fate and help to preserve precious resources on our planet (we only have one!). There is true satisfaction in doing something for more that just yourself. My friends want to know who trained me, what my diet was like and if they can all have my plan. I am truly flattered. When I set out to do this, I was determined to never count a calorie or step on a scale. I did not want to eat differently at dinner time than my family (being that I cook every night for us) and didn’t want to obsessively meal prep or weigh food. I didn’t want to spend three hours a day in the gym because I don’t have that luxury of time anymore. I also didn’t want to obsess over my body or it’s “flaws”. So the deal is… I did it exactly how I wanted. I did it my way! I trained myself. I take great pride in that. I created my own workout schedule and routine. I created my own diet plan. I also helped to create my own suit working with an amazing designer I found. I just loved that process. It was more exciting than picking out my wedding dress! Ok, almost as exciting (please don’t tell my husband I said that). I did my own hair and makeup for the show, putting my hairstylist skills to good use. What I did seek out, was much needed help with posing. That s#!t does not come easy! NOTE* If you are in the South Suburbs of Chicago and are looking for a great posing coach, please message me. I have a recommendation! The nice thing about doing this at 41 is that I have grown to like and accept my self and my body, and that is certainly not going to change now with competing. It is a known fact that this industry can mess with a few minds. Not mine. I wanted simplicity and freedom and that was my intention. I absolutely enjoyed myself. I have heard the horror stories of other competitors and many women have told me they also wish to compete but can’t imagine doing it with “THAT RIGID DIET” and frankly, yes, I agree, trying to keep this lifestyle up on a standard American “clean eating” bodybuilder’s diet is not maintainable for the majority. A plant-based lifestyle, to me, is true freedom! I feel blessed with my knowledge. Sadly, I don’t think many people want this kind of freedom, most people are looking to obsess over something. If you are interested in how I prepared for the show, there will be more posts coming, and I will share tips. Sign up with your email to follow my blog so you won’t miss anything. I never share your information, I only update you with new posts. You can also follow me on my Karmatarian Facebook Page or follow me on Instagram http://www.instagram.com/Karmatarian. Both of these accounts could use some lovin’, thanks! The hardest part about competing for me, was reaching out to others for advice, help and direction and then still feeling lost. I had to keep moving forward regardless. I started out in total fear of the unknown and then realized I had to have faith that it will all work out. I had to believe that the right information would be delivered at the perfect time, because mind you, I had NO clue what I was getting myself into. I had NO experience with competing. But dammit, I was doing this! I didn’t know anyone who competed before me that was willing to sit with me and just share details. In hindsight, this was all for the best. I truly wanted my own experience and not to re-live someone else’s. I am the type of person who prefers a plan with details, and there wasn’t much of that… I did it anyway. The main thing is not to have expectations of placing, but imagine yourself holding a trophy. Imagine how that would feel, and then train your a$$ off… Or on. Whatever the case. The most fun part of competing for me was helping to create my beautiful suit, walking around the kitchen in 5 inch heels, practicing and creating my posing routine (I suppose I could still cook dinner in my heels, lol), waking up 5 days a week at the crack of dawn to workout and never missing one workout for the whole 6 months I trained (I used to be a night owl, so this was a HUGE accomplishment for me). Taking selfies to track my progress and lastly, just doing what I said I would do. I held myself accountable and I did it. Most women want to step on stage, but never do. In closing, you can do this too! I certainly NEVER thought I had a nice bikini body with all it’s curves and teeny tiny waste. And I don’t. I never will. The competition is not about being Miss Hawaiian Tropic, thankfully! It’s about reaching personal goals, showing off the hard work of building muscle and creating the best body YOU can have. Each competitor has a story, each has their own unique body shape, and if you don’t go insane comparing yourself to the pros of the industry with all of their youth and silicone, you can have a lot of fun with this. Ps. I make no judgments on their silicone. I just don’t have any, but I have been asked if I do. So now you know. There is something to be said about gaining mental strength through physical strength. I recommend competing or at least training like you are competing to empower yourself as a woman… or a man, and if you are vegan, to strengthen your own convictions and walk proud. So now you too can say… take that, meat eaters! What are my plans? I originally planned to do one show. To prepare for this show I spent 6 months going to the chiropractor 3 days per week for back issues (can you say hairstylist) but nothing helped like just getting into that gym for the next 6 months after that and strength training! I recommend it. Since I won my show, I believe it is the challenge I personally need to want to take it to the next level. So I will continue with my training (for the sake of my back and also to keep representing us vegans) and most likely enter a pro show sometime toward the end of 2015. Again, doing it with NO expectations. This should be fun!!! I am over the moon excited for a friend of mine who has just opened Chicagoland’s first vegan shoe store. Pinch me, I must be dreaming! The store boasts “Beautiful shoes with beautiful souls.” These shoes are Vegan, eco-friendly and ethically produced! Alisha Kettner with her husband Kris, opened this little gem in Oak Park, Illinois on August 6th, 2014. Their grand opening will be this weekend Friday, Saturday and Sunday from 11-6. I am excited to be going for the ribbon cutting, which is first thing Friday. I would love to see you there! See below for details. Read the entire interview here to learn more about Alisha and her reasons for opening a vegan shoe store. You can also read more about Amour de la Terre on their website. I personally learned the ugly truth about the leather industry from the much recommended documentary Earthlings. We all think we know before we dig deeper, but we really have noooooo freakin’ idea. I have had dreams of shopping at a vegan shoe store ever since. I met Alisha a few years ago when she was a beautiful bride (and vegetarian at the time). I had the pleasure of doing her wedding hair. One wonderful day, while we were practicing her updo we had a conversation about vegetarian vs. vegan. She wondered how I could live without cheese as a vegan, and I shared with her a little truth about the dairy industry. Voila, another vegan couple was born. I say couple because Alisha’s wonderful husband Kris followed her lead. Well, I guess it really wasn’t voila… it was actually after doing her own homework and research that she came to the vegan conclusion. But still, isn’t that cool? I had no idea that a little inspiration and meaningful conversation would lead to a much needed vegan shoe boutique! YOU are ALL very welcome. Lol! I always say, if I can inspire just one person, it’s all worthwhile… and this is really really exciting for me because Alisha is someone I am so proud to have inspired, and in turn she will inspire so many more through her beautiful store. You never know who you might inspire or how you might play an important role in others lives. So vegans… please keep on being your awesome vegan selves and sharing your light and your knowledge. We are making a difference! UPDATE: PHOTO GALLERY OF THE GRAND OPENING CELEBRATION 8/22/2014!!! Phenomenal vegan cake by none other than the Chicago Diner! BEST cake I have had! Beautiful vegan food each day of the grand opening celebration. It was amazing. I believe it was catered by Munch. Me and one of the most beautiful souls I know, my great friend Maureen. I had intentions of taking photos of all the shoes but I got to mingling… all of the shoes are gorgeous! 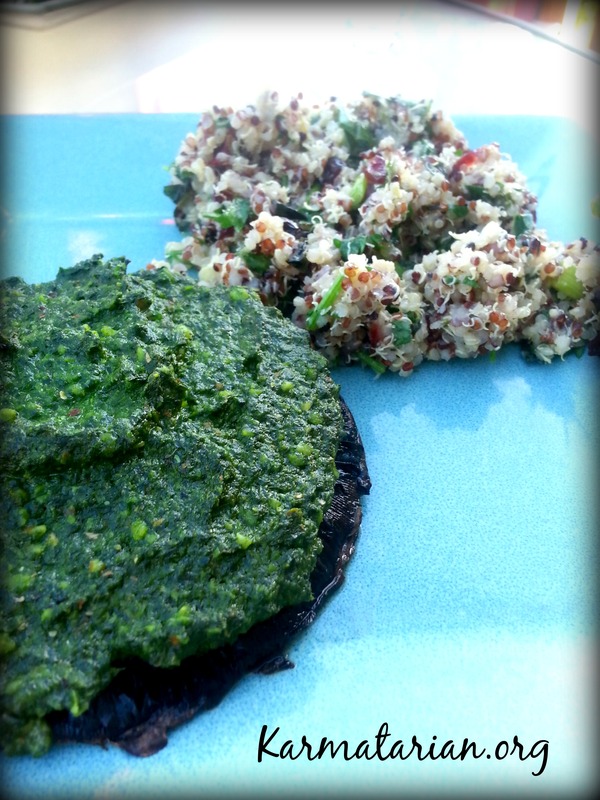 Spinach pesto portobello mushrooms with cranberry and mint quinoa salad. This was our delicious dinner yesterday! I threw this together pretty fast. Don’t you just love when that happens!? I really liked this combo. Try it and be sure to let me know what you think. I haven’t made portobello pizzas in a long time. I usually like them with red sauce as in my other mushroom pizza recipe on the blog. I tend not to do pesto too often because of the large amount of basil needed. Basil costs a lot it seems, and it goes bad quickly for me. Maybe it’s just me? I don’t buy it too often. I prefer to grow it, but I don’t have any right now. I always have a huge tub of fresh spinach on hand, so I thought I would try a spinach pesto. This one is not fat free, it contains olive oil. Before I share the recipe, let me tell you where I’m at with oil right now. The cleaner I eat, the more obvious it is that my body doesn’t like certain oils. Canola, Sunflower and Safflower oil for sure. I can feel the inflammation take hold. Gee, I wonder… could it be all the GMOs and the fact that I’ve eaten it my whole life? Manufacturers put in in EVERYTHING!! No more of that! I read all labels now and avoid canola and sunflower as best I can. I made a commitment a while back to cook whole foods plant based style, and that is… little salt, no sugar and no oil, nothing processed. I do this 4 nights per week. I have been doing this steadily for about a year and a half now. The other few days of the week I like to have fun. There might be a little oil, or lightly processed vegan foods combined with whole foods. These recipes happen to be more fun to post. Anyone can pick up a Forks Over Knives cook book. This is my go-to book! I’ll admit, it was intimidating at first, with few pictures, but now I just usually open the book and wherever I land, that is what I will try. Who said I’m not adventuresome? If I do use oil, I prefer olive, grape seed or coconut oil. If I want to do a fat free pesto, I use veggie broth, tofu, water or soaked nuts in place of the oil. The mixture just needs something to wet it down a touch in the food processor. I have to get dinner on the table every night. I do balance out the oil/no oil/ fat/no fat recipes over the course of a week. I definitely have a family with differing needs in the calorie department. The oil of course, helps to make this dish rich and creamy. It sure makes it good and we enjoyed it! Add all of the ingredients (except the portobellos of course) in the food processor and blend until smooth and creamy. Heat your oven to 350 degrees. Wash and dry the mushroom caps and remove the center stem. Fill the mushrooms with pesto sauce and place them in a glass baking dish (non greased). Bake for 25 minutes until the juices of the mushroom start to run. Let cool slightly to set, before cutting. Mix all of the ingredients together and toss. Taste and adjust. All I know, is that if I were a turkey, Karen Dawn can rescue me anytime! Her amazing voice can put me right into a trance. She reminds me of Snow White, but who is now all grown up, living in CA and rescuing some very LUCKY turkeys every Thanksgiving. What an inspiration! This video hits home, as once upon a time, I had a Cockatiel named Sunny Bird who lived with me for 15 years. He showed me first hand how smart and sensitive birds can be. His favorite thing to do was enjoy a warm blow dry after a spa treatment ;) So I know that feeling of caring for God’s special animals. There is little that is more rewarding than helping to make someone feel safe, happy and loved. Sunny Bird would close his little brown eyes and just sit there, just like the turkey in the video, until he was all dry. I miss that little guy. Memories of blow drying Sunny bird is the closest I will get to rescuing a turkey this year, well, if you don’t count our adopted Turkey from Farm Sanctuary. We love doing that every year! I hope Karen’s video inspires you to have a kinder holiday season and to inspire those around you. Maybe it helps to see turkeys in a different light? I have never enjoyed Thanksgiving as much as I do now. It took having that little something more to celebrate which is bigger than myself, to realize how much more meaningful it can be. I love celebrating life. I know per history we are supposed to be celebrating having food to eat, but luckily most of us never have known what it’s like to not have food to eat. So without knowing that contrast, the genuine grateful feeling can come from showing mercy to another by not cooking it and shoving stuffing up it’s arse. I know this contrast well, because as a researching vegan, I see the horrors on a daily basis. It’s definitely kindness that makes this holiday special now. Heck, it makes every meal special. I am sorry to say, that I haven’t always shown mercy, but I didn’t know better back then. Now I do and act on it. One day, when I get to those pearly gates, I certainly hope to be forgiven. What’s on the menu this year? Well, we will enjoy a mini feast starting with cranberry pesto crostini, a wonderful green salad with avocado, cranberry, almonds, chopped apples and balsamic dressing. A gardein stuffed roast, orange grand marnier cranberry sauce, garlic and rosemary mashed potatoes with mushroom gravy, rosemary and garlic green beans, sweet potato casserole with pecans and then if there is any room left, we will stuff in some pumpkin pie topped with coconut whipped cream. Boy, I better get started in the kitchen , huh? One thing is for sure, we LOVE food around here and are grateful for every delicious vegan bite. I hope you have a wonderful and kind Thanksgiving! What makes the original soul bowl so great is the Native Food’s homemade seitan. Homemade seitan is not going to happen anytime soon in my house, so I just buy it from the store. But that’s not so healthy so you say? Here is what works for me… I committed long ago to making 4 or more dinners per week out of the Forks Over Knives cookbook or handbook or similar style cookbooks and recipes off the web. That means, no oil, little to no salt or sugar, no vegan processed foods, only tons of flavor through whole plant based foods and spices. The other nights I might add a little oil. One night a week I may add convenient vegan foods. This way I know me and my family eat top notch, delicious and healthy the majority of the time. So when I throw in a vegan pizza, or we cook veggie brats on the grill or enjoy gardein crispy tenders… it is fun, enjoyable and our cheat… but is it really cheating? I refuse to feel guilty. Sounds funny for a vegan to “cheat” with versions that are actually healthier than the original meat counterparts, but I’m just throwing it out there because too many non-veg people tend to look for flaws with people who eat healthy or vegan. They falsely think these types of vegan products are bad. They aren’t bad. Certainly not when you compare them to animal products and that whole mess. These types of vegan foods have their wonderful place and when vegans enjoy what they eat, they tend to stay vegan. That is key. You can be vegan or you can be a health nut. I am a bit of both, so I am armed with all the ammo I need to stay on this awesome vegan wagon! We might be vegan in our home but we still enjoy the chewing sensation, which unfortunately is what eating dense animal flesh provides to many a non-vegan. This is why us vegans enjoy these kinds of convenient vegan foods and “meats” which are familiar to what we grew up with, without the harming the animals part. So there you have it and now there is no need to wonder any longer. It is as simple as… vegans still like to chew and we still like variety. I wish I didn’t have to justify any of this… but so go I. This recipe is easy, but takes some prep, multi-tasking and assembly. Over all it’s quick and easy. The whole recipe can be found at the end of the post. First, you need to prepare some brown rice. I like to use my rice cooker. 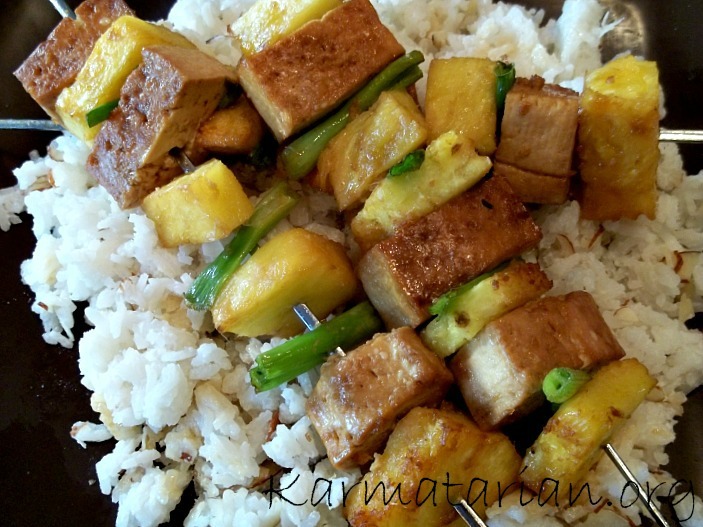 I tend to throw it on early in the day when I am thinking about what’s for dinner so that I am not left scrambling without brown rice at 5 o’clock or forced to make something else that doesn’t require rice because I forgot or ran out of time. Brown rice takes a long time to cook. You can always freeze portions to be used at later time, too. The brand of rice I really enjoy lately is Lundberg short grain brown rice. You’ll want to get your water boiling to steam your veggies. I enjoy a blend of broccoli, cauliflower, sliced carrots and this time I threw in organic shelled soybeans but you can omit these if you choose or add another type of veggie. Bake your gardein crispy tenders while your veggies are steaming. These take the longest amount of time, a whopping 20 minutes. Prepare your kidney beans (meaning take them out of the can, rinse and drain). Pull your vegan mayo out of the fridge or make your own (recipe below) and find your favorite bbq sauce minus the high fructose corn syrup, of course. Lightly steam your kale in a skillet will a small amount of boiling water and a lid. Takes about 2 minutes to steam. When everything is ready, assemble. Start with a scoop of rice, then a scoop of beans, a scoop of veggies, a helping of steamed kale and then approximately 2 tablespoons of bbq sauce and 2 tablespoons of vegan mayo. Mix until all the flavors are incorporated. You can cut the tenders into the dish….. and EN-freaking-JOY! Sea Salt for serving, to bring out the flavors, only if necessary. Pre-heat the oven according to package directions for the crispy tenders. Boil water for steaming your vegetables. Rip the kale from the stems into bite size pieces and rinse. Set aside. Open the can of kidney beans, rinse and drain. Prepare mayo and bbq sauce. Bake the crispy tenders and steam your veggies. When those are both finished. Steam the kale in a skillet with about a 1/2 cup boiling water for about 2 minutes covered with a lid. Drain. Assemble your bowls. Put a scoop of cooked brown rice, topped with a scoop of kidney beans, a scoop of steamed veggies and finish with steamed kale. Add approximately 2 tablespoons bbq sauce and 2 tablespoons mayo. 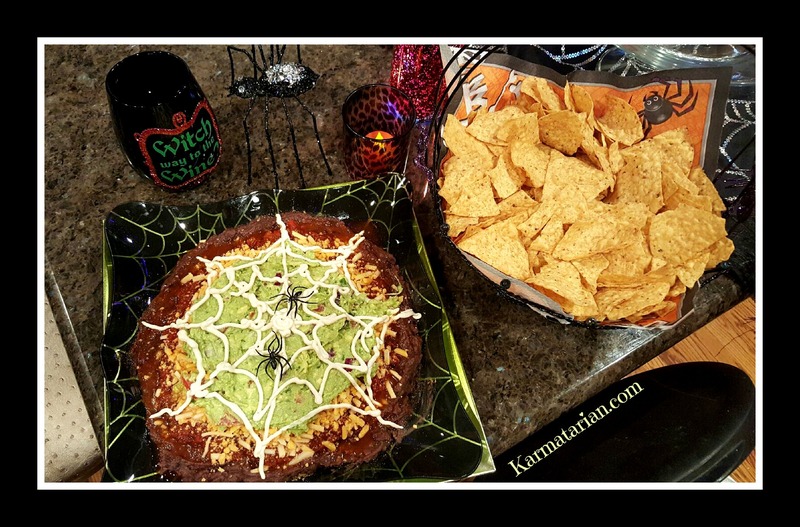 Mix to incorporate flavors before digging in and enjoy! Put all ingredients into a high speed blender and blend until smooth. Taste and adjust seasonings. Store in a glass jar in the refrigerator. This keeps for about 2 weeks and will thicken upon refrigeration. Back then, we were just two fun girls with VERY big hair who rode the same yellow bus. The universe knew what it was doing that fateful day we crossed paths… our friendship story continues on to this day – oh some 25 years later. We are forever friends… as Cathy would say. I admire her for her generous heart and justice oriented way of thinking about the world and the people in it. I agree with her, we need to pull up our big girl or big boy pants and step it up and do the right thing. It seems, like minded friends tend to find each other in life, even years before they become who they are destined to be. Cathy and I have things in common now, that weren’t even obvious on the radar back then. Growing up, I spent a lot of time at Cathy’s house. Her family is Italian, welcoming, generous and very entertaining. They became my second family. I ate dinner there a time or two! Their family’s homemade pasta sauce was always out of this world! Funny how many fond memories can be centered around a big bowl of noodles and some sauce. So I’m over here thinking about what I might do with all these tomatoes I picked from my Dad’s garden and I found myself dreaming about the old days and that sauce. I can’t believe that I don’t know how to make that sauce or that I have never taken notes. But I guess it doesn’t matter, because now I’m doing things different. So I reached out and asked Cathy if I could veganize her family’s secret sauce recipe and she surprised me with the fact that she had already veganized it. Cool or what? But who are we kidding? Even she admits… it’s totally not the same family recipe, because the original just can’t be veganized to taste exactly the same. You know what? That’s OK. We will create new memories with new sauce with its new flavors… Why? Because change is the only thing we can count on in an ever changing universe. We know that vegan sauce is much better for everyone involved anyway, it also focuses on the future… and there is so much exciting possibility in the future! I had my hands on the basic recipe, but when I got into the kitchen, of course I made changes and made it my own. That’s what cooking is all about. I’m sure Cathy won’t mind. She inspired me! Not only with her sauce recipe, but her friendship and the fact that she is happy to share. Being vegan and picky, it’s hard to find a sauce that is organic, oil free, sugar free and low sodium. I think I might have one or sometimes two to choose from at the store. So why not make my own? Just like my hummus recipe, this is just inspiration to do it! I know that you probably already have ideas of what pasta sauce should taste like. God forbid you are also Italian and judging the hell out of this. That’s cool. Spice and adjust, and do as you must, but hear me out on a few ideas here. I am just going to say, I am quite fond of my sauce and it could be that it’s homemade with care and love or maybe because it’s a little different. Either way. When I can’t help myself but to keep dipping my spoon to taste it over and over while it’s cooking, I know it’s a good recipe. And it’s still… just my opinion. First, most of us have been conditioned to think we NEED to cook with oil. It’s just not true. I have found jarred, oil free sauce before and most recipes I make these days cook up just fine without oil, so I know it can be done. You may have to man the stove just a little bit more, and maybe not keep the flame ridiculously high… but it can be done, and without burning. Second, did you know that most pasta sauce calls for sugar to neutralize acidity of the tomatoes? In this sauce, I wanted more focus on whole foods so a grated carrot did the trick. This is where the sweet comes in without sending a diabetic into shock. We are blending this sauce at the end so it’s all good. Third, sodium is another story. This is up to you. This sauce does contain sea salt. It needs it for flavor, just sayin’. You can add it or not add it… you are your own cook and the gatekeeper of your good health. Just know that jarred sauce is usually very high in sodium. The good rule of thumb for packaged products is not to go over calories per serving with sodium per serving. So if it’s 100 calories per serving, sodium should be 100 milligrams or less per serving. This is very tough to do, unless you avoid packaged products. I do enjoy sea salt, and if I am going to break this rule and get some sodium in, I might as well get the added benefits of extra trace minerals in sea salt vs regular table salt! I don’t have high blood pressure. If you do, proceed with caution regarding sodium in your diet. I have been trying to do the math and 1 tablespoon of sea salt divided into two quarts and then down to individual servings can’t be all that bad, can it? Oh never mind. Fourth, I am thickening this sauce with arrowroot powder because it doesn’t dilute the spices and flavors and also because I don’t want to add canned, already made pasta sauce to thicken this. The reason is, most cans leach the aluminum into the sauce due to the high acidity of the tomatoes. Then there is the worry about the BPA lined cans. Who needs it? I have gone out of my way to avoid aluminum, even changed my deodorant as some of you might know. I am not innocent, I use a few canned goods here and there, but I am becoming more and more mindful. Fifth, the secret ingredient to this particular sauce is… Cinnamon. Just a dash. After making 4 batches of sauce, and trying some without, I couldn’t resist adding it to all. Cinnamon gives quite a unique twist. You can however, omit it. Place chopped tomatoes, (with skin and seeds), into a large stock pot with 1/2 cup water and heat on medium/high for 10 minutes. After 10 minutes, mash with a potato masher and lower heat a bit if necessary. Keep an eye on this and stir often, adding more water only if needed. Add grated carrot, garlic, salt and spices except for the cinnamon. Be sure to roll and crush the basil between your fingers to release more flavor. Cook on low/medium heat, simmering for another 20 minutes. Stirring often. Taste and adjust seasonings and add cinnamon here. Raise heat and bring sauce back to a low boil. While that is happening, in a small bowl, use a fork to mix 6 Tbs Arrowroot powder with 5 Tbs water to create a thick paste and pour this into the middle of the sauce while stirring constantly. The sauce will thicken. Cook 1 – 2 minutes. Do not over boil or the arrowroot will lose its thickening ability. Remove from the heat and ladle sauce into your Vitamix or other blender, blend on high to smooth out remaining tomato skins, seeds and grated carrot (I left a little un-blended for texture, just because). Return sauce to the pot, glass jars, containers, etc… use, freeze or give some away. The bubbles created from blending will dissipate in about 10 minutes or so. Ok, tell me… how many different natural deodorants have you tried? Have you found “the one”? Or like me, did you give up? Seems like an impossible task doesn’t it? You are totally bluffing if you tell me that salt crystal worked for you. Propylene glycol – Causes damage to the central nervous system, liver and heart. Phthalates – Cause a high risk of birth defects. They disrupt hormone receptors as well as increase the likelihood of cell mutation. Triclosan – Is actually classified as a pesticide and is carcinogenic. It brings down immunity so it’s not wise to use disinfectants or hand sanitizers with this hazardous chemical. All of the above and more can be found in the mainstream deodorants. The dangers are certainly no “SECRET” and I am one of the growing many that are ALL for ditching these types of deodorants, but I just don’t like throwing away money on natural products that don’t work, over and over. I have tried so many “better” deodorants over the past few years. I either felt the perspiration after a half hour or it just didn’t work well to control odor. The one thing for “SURE” is that my confidence takes a dive if I feel I smell. No one that I know wants to be smelly! Toxic brands make millions of dollars because unfortunately, they work well and are cheap. It may be cheap and easy now to run with these regular brands, but it’s a high price to pay later, when we smell great but can’t remember our family members. Vegans, you may notice that you smell a heck of lot better in general compared to your meat eating days, aside from deodorant no deodorant. We can attribute this to added greens detoxifying the blood and a lack of animal flesh having a heck of a time trying to be digested in our gut. Vegans tend to eat a ton of fiber which help things move along nicely therefore toxins are being removed easily. Superfood supplements such as Wheatgrass also have known benefits of reducing body odors. With all that being said, I still enjoy the extra barrier a good deodorant provides. I am an active person who also works out, I happen to be in other people’s comfort zones a lot when I am cutting or coloring hair (my forever side job). My thing is, I don’t like sweaty pits – natural, whatever, I just don’t like it. Nothing had been working for me, so I resorted back to the conventional deodorant for the most part. This gets complicated… I used the natural brand in the Winter if I were wearing a big sweater or I was staying home, and I would use the preferred store brand in the Summer or if I were actually going somewhere. Sometimes I would apply the natural deodorant first and then I would apply the harmful one over it. I figured that it would create a barrier. Idk? I was not happy with this system. I became so aware of the dangers of deodorant that I basically just prayed each time I rolled it on. Mostly, I justified it with the fact that I eat well, so I must stand a better chance. Bad. Bad. Bad. Fast forward to this past August and the veggie fest here in Naperville, IL. My friend and I came across a deodorant booth. Dare I try this again? They had a travel size, so why not? We both decided to try it. I’ve been walking around surprised and happy ever since because IT WORKS! I can’t believe that I finally attracted the right deodorant! I know, it seems silly if you haven’t gone through the struggle yourself. When I asked my friend Mel about it, I was expecting her to say that she hadn’t tried it yet. To my surprise she did, and she likes it as much as I do. There are two to choose from, Death by lavender and Revolver. At first I wasn’t sure about the lavender scent. It’s a woodsy lavender. Revolver, is more manly but I was told that many women like it. I went with lavender. The scent turned out to be perfect, and is much lighter wearing than you might expect. It applies fine, now that I figured out I was dialing it up too high, which created a messy application. It needs to be just a tad over the level of the container. Then again, I only bought a mini to try. My guess is that the regular size applies nicer. I will find out soon, because I placed an order yesterday. Either way, this product rubs in nicely using fingertips if need be, and I personally don’t mind doing that because the product works great! I have used this deodorant these past few weeks during the heat wave without complaint. It also passed the anxiety test when my car decided to break down on a country road where there was nothing but cornfields. Oh, yeah, it was sweltering! My nerves were racked, but I smelled good. My armpits stayed relatively dry while I sat waiting for help, generally sweating, and pondering all the pros of moving back to the city. If you compare these 5 simple ingredients – coconut oil, carnauba wax, cornstarch, baking soda, and essential oil to the 5 toxic ingredients I wrote about above, switching is a no-brainer. My husband has been using Trader Joe’s brand and he says it’s ok. I don’t get it because that one does not keep me dry plus it has added cotton. Does that cotton have pesticides? I’m sure it does. No where does it say organic. Oh yeah, and it contains Propylene glycol among other crap disguised as harmless. Good thing I ordered my husband The Revolver. I bet one could make their own deodorant with ingredients this simple, but I don’t want to make my own everything. I am a modern girl and I only have so much time in a day. I am happy to support a conscious company who will make a cruelty free product with packaging that is recyclable. They’ve also just been certified organic by USDA along with many other certifications. Good to know. I am happy to have found North Coast Organics. Looking forward to any new products they may offer. If you know of any other brands of deodorant that amaze you, please share them with me in the comments. If you don’t, and are looking to lessen your toxic load and still smell your best, I recommend trying this product and ditching mainstream deodorant – like NOW. You may not be used to natural products and you may be inclined to compare this to mainstream products in scent or application or cost or whatever… DON’T, because it is different. But different good. It works fabulously toxin and chemical free. A friend of mine always signs off with “smell ya later”, I say… noooo thanks. Glancing at the phone first thing this morning, all I saw was the number 22, as in today’s date. I had an instant thought of uh oh… death. I can’t explain it, and I know it’s not positive or uplifting for a first thought, but it was a split second intuitive feeling. I also know the number 22 to be a great spiritual master number, besides what the 2’s have also come to represent in my experience… the possible passing on of someone you know. Trying to make sense of the grief, I was thinking… is my sorrow really about my relationship to the elephant herself? After all, I’ve never met the little one. Or is it about me? My loss? I am pretty sure it’s about the hope which I had for her. The prayers that I prayed for her. And yes, it is about me and my goals surrounding the day I fostered this sweet soul. I wish to do more good in this world and she was a part of my bigger plan. I guess you can’t help but feel a million ways. I remember how excited I was the day we fostered Ajabu and how my 5 year old at the time excitedly painted me a beautiful elephant picture. I’m emotional that this brief fostering experience had such a sad ending. I dreamed of visiting a healthy Ajabu in Kenya one day. After all, she seemed to be thriving. My grief may have to do with all of those things above, but one thing I know for certain is that I am grieving for humanity and how cruel humans are acting out of greed, and that this baby elephant even needed to be rescued by an orphanage to begin with. Elephants are being poached at the rate of One every 15 minutes with a prediction of extinction by the year 2025! Elephants hold the most light on our planet along with dolphins according to spiritual teachers. Could that be why this is hitting me so hard? The fact that elephants are so intelligent, have such close bonds with their families and stay with their young into their teen years and beyond is amazing. They are also known to grieve as deep or deeper than humans… that is incredible to me. Imagining the heartbreak of Ajabu’s surrogate mum named Sonje who loved Ajabu and the heartbreak of the keepers who were so close with her brings tears to my eyes. Although, I Imagine what an honor it must be to be a keeper at the elephant orphanage and to work closely with these magnificent Elephants. The keepers are heroes every day! Right now, more light than ever before is entering the planet shining the spotlight on darkness and bringing it to our attention. These are things that we need to fix and address such as poaching of our wild elephants and rhinos for their ivory. It’s pathetic and all for what? A carved trinket! I feel so deeply about our wildlife right now and what they go through at the hands of lost human souls. I feel that sensitive souls like myself are being put through hell at the moment with animal exploitation stories at every turn. But I am strong. I am able to look at what most people would look away from. I am willing to make changes where they are needed, such as going vegan. I am willing to be a voice for the voiceless, and support where I can. I am also willing to be a role model for others. But being strong doesn’t mean it doesn’t get to me… indeed it does. I think this path I’m on is meant to build my character and it is not easy! I would never judge sensitive souls as being weak or inferior. Far from. We also ALL have something else to contend with, and that is all the energy swirling around as of late, helping us to release and rebuild for the new world. It’s a bit much. I’m not going to pretend that it’s not, and it’s affecting all of us in crazy ways. I now see that my lesson is to get through discouragement. I have had to take breaks from blogging and posting when I feel discouraged and then I pick myself back up and move forward again. I would love to work through this once and for all, so that I am only moving forward. Here is a great post I read today on Spirit Library (I love Spirit Library, btw) by Sarah Varcas, that explains a lot about the recent energy and why the ups and downs are happening right now. We will all get through this and be better for it. I am keeping this hope. would like to do more, please visit iworry to find out about the October 4th walk for elephants and to sign the petition. Do you feel the intense energy lately? What is your recent spiritual learning experience as an animal lover/vegan? What is going on in Facebook land lately? Have you noticed your friends sharing random recipes on the news feed in order to save them? I’m seeing this from at least a dozen friends. This wouldn’t disappoint me so much if they were healthy and appealing… but they are so called ‘comfort’ foods. Sure… so comforting that you can lay yourself to rest in a cozy casket much sooner than later. I know not everyone eats the way I do, but what happened to the healthier middle of the road recipes? It seems that everything is extreme lately and it’s either Kale or Bacon. I’m going with Kale. Btw… Saving recipes… isn’t this what Pinterest is for? Being that I don’t want to hide my friends (I happen to like them), the good news is that this may finally break me of my personal Facebook habit (fingers crossed). It’s been sucking the life right out of me for too long, and now, it’s gotten down right depressing. Why dear God, is the world moving backwards? For the rest of us moving forward, I want to share a delicious, whole food, healthy and oil free dressing to enjoy with your kale. This came about because I am ADDICTED to kale right now. I finally found a fun way to eat it. Sure, I add it to recipes and smoothies and make kale chips but salads usually don’t appeal to me because of the bitterness. Even when it’s rubbed with lemon juice and salt, it still doesn’t work for me (at least right now, but who knows?). All I do know is that because of this new found process, I am drawn more to kale. Kale, kale, kale! Here is what I do… I take a skillet and fill it with purified water, just to cover the bottom of the pan. No more. Set it on the stove and turn the burner on high. I rip the kale into bite size pieces and wash it while the water starts to boil. I add the kale, cover it, turn the burner down a bit and set the timer for 2 minutes. I check it before the time is up because most of the time it is done. I drain the little water out and VOILA… Steam-boiled kale with no bitter taste! And fast! I got the idea from the Forks Over Knives handbook. 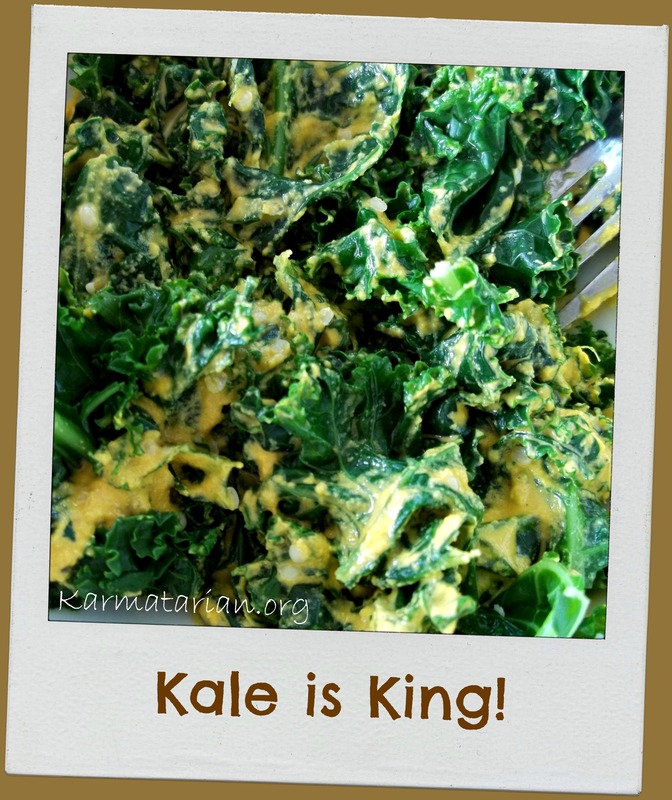 Oh, let me tell you, the recipe for kale with miraculous walnut sauce is MIRACULOUS indeed! I can eat it Every. Single. Day. I don’t want to abuse a good thing, so I came up with a similar dressing that packs in carrots and miso… two things which I try to incorporate more of into my diet. Walnuts are not to over-do if you are overcoming heart disease or cancer, so keep that in mind. In that case you would want as low fat of a diet as possible. But walnuts are definitely a super-food that you want to eat. You will also need a powerful blender in order to make this happen for you. Sorry, it’s just the way it is. Health benefits of this dressing FAR outweigh that cute sour cream, butter, milk, cheese and ham filled muffin cup on your Facebook news feed. There’s no comparison really. Carrots when sliced, interestingly look like eyes.. and they just so happen to benefit the eyes but also the skin too. They protect us from disease and boost immunity. Carrots are also anti-aging whereas that bacon cup will age you just looking at it! Miso is a fermented food which helps to establish good digestive bacteria and boost immunity. It is a complete protein and has high quality B12. It aids in digestion and protects us against radiation. It’s also anti-aging. Sounds good so far, huh? Walnuts are shaped like little brains for a reason – they contain high levels of DHA to help improve brain health. A super antioxidant rich food that is a high quality protein. Walnuts are considered the king of nuts and we really benefit by adding a small handful into our diet daily. My healthy carrot miso dressing is fast and easy and depending on the amount of water you add, you could keep it on the thicker side and use it as a veggie dip. It’s not overpowering in flavor perhaps a little on the milder side. Add more miso if you prefer. Update 6/13~ I just made this again with extra miso aaaand a little champagne vinegar which was a nice addition. Place all ingredients into a high speed blender and blend on high until smooth. Add more or less water depending on your preference. Question – What are some fun ways that you add more kale, carrots, walnuts or miso into your life? I love Portobello Pizza. 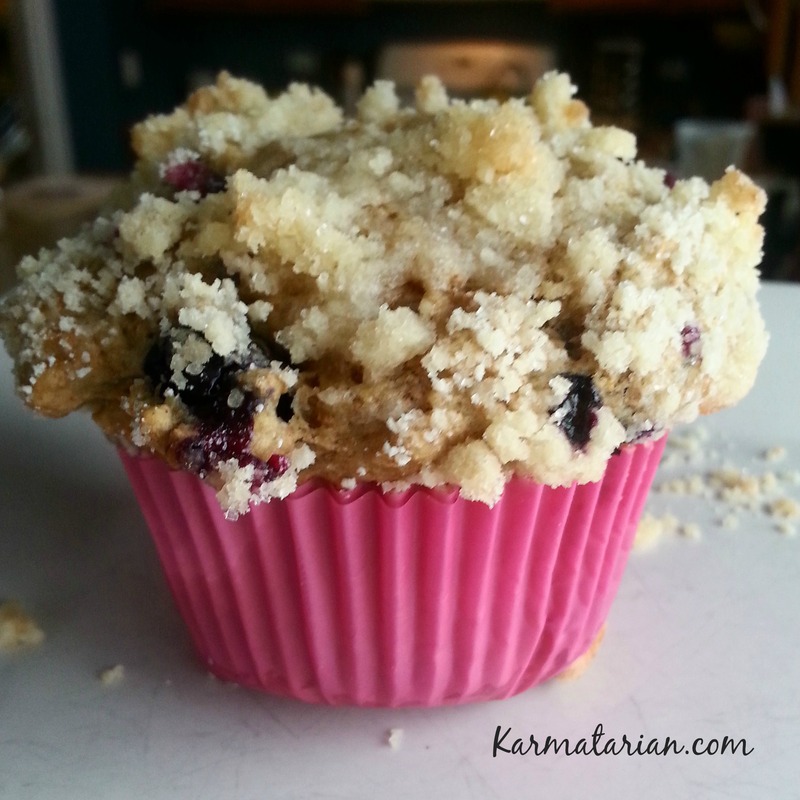 It’s one of the easy, fast, low fat staples in my recipe rotation. It’s the kind of meal that let’s you have dessert afterward without guilt. I usually serve this with a side salad and wild rice blend that is cooked up in veggie broth with a little added nutritional yeast. Or… whatever leftovers I might have on hand. In just 30 minutes, Dinner can be served! Sometimes I add basil and extra garlic or spinach leaves. Sometimes I fill these with a vegan pesto. Either way, they are fast and good. This idea of Portobello Pizza isn’t new to me and probably isn’t new to you, either. However, I used to make this pizza with dairy cheese (pre-vegan) and then went on to make it with vegan cheese. I found that in both scenarios, the texture of the mushroom paired with sauce AND slimy cheese, was well… too slimy. I can’t think of a better word. Maybe slippery? I mean, the whole topping just slides right off the mushroom if you aren’t careful. Maybe you can relate? I like to change up textures and flavors all the time in the kitchen and Portobello anything is a nice change of pace. As for the pizza, I finally found a good combination that is very pleasing and complimentary. I now use a crushed cashew “cheese” topping that I have used before in other recipes, and it happens to be perfect for the mushroom pizza. You have to try it! This can be a low sodium, oil free and gluten free meal depending on your sauce and your side dishes. It can be VERY hard to find a jarred pasta sauce without oil, a ton of sodium and sugar. Good luck to you! The last sauce I used was from Trader Joe’s, you know the fat-free organic one they usually hide waaayyyy down on the bottom shelf. I don’t know why? If I had the jar here now, I could tell you the sodium and sugar content but my guess is that it’s not great. I was just happy it was OIL FREE and ORGANIC. I’ll double check it next time I’m there. You probably can’t believe I let that slip by. I try to choose my battles over here and I tend not to fight them all at once. Things usually balance out over the course of the day. I do know there is a brand of oil free and low sodium pasta sauce out there which my dad recently found and likes. It will most likely have to be ordered on line. I will get back to you with the name of it. Remove the pan from the oven and top pizzas with ground cashews and bake again for 5-10 minutes longer… but watch closely. Cashews should be barely toasted. If you are brave, you could broil on low for a minute. I would love to hear your reviews, topping ideas and more. Feel free to comment below.